Power Catamaran AIR 99 under development at Oxygene Yachts – Superyachts News, Luxury Yachts, Charter & Yachts for Sale. 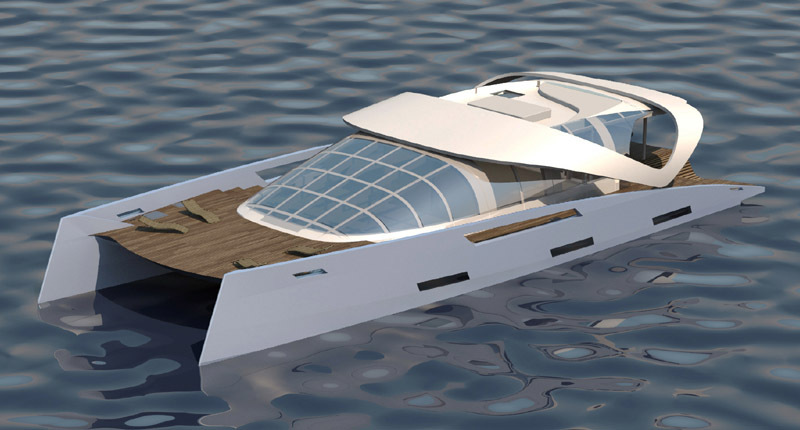 The “carré”, the main living area of the AIR 99 yacht, displays a 1292-square-foot surface for a unique sensation of freedom. The perspective from the stern unfolds along the boat’s 88 feet axis and spreads, uninterrupted, towards the horizon. The wide living area of super yacht AIR 99 has allowed the integration of two additional master cabins: she counts six, all in curves and in perfect harmony with the spirit of the AIR range. The reversed bay and the die-cutted bulwarks of AIR 99 superyacht elegantly differentiate her from the power catamarans of her caliber, while offering the same advantages, including a 30-knot top speed.